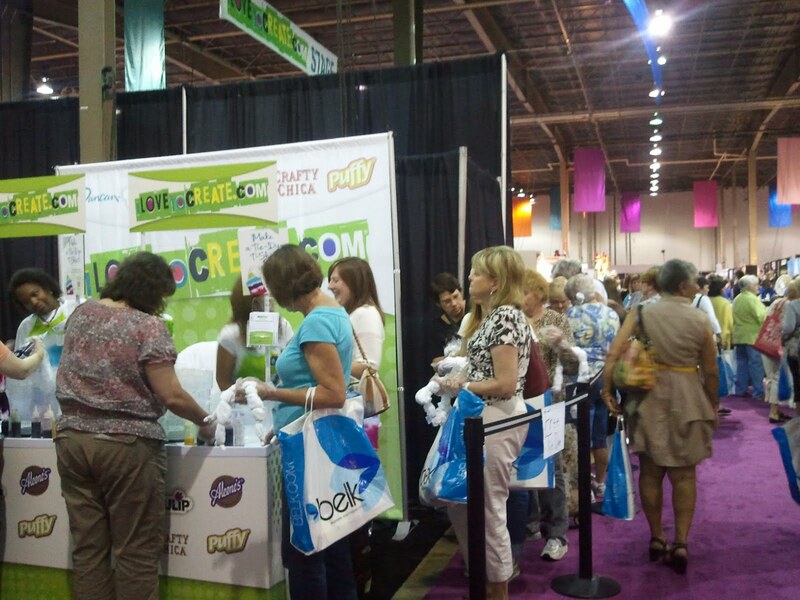 iLoveToCreate Blog: iLoveToCreate at the Southern Women's Shows! 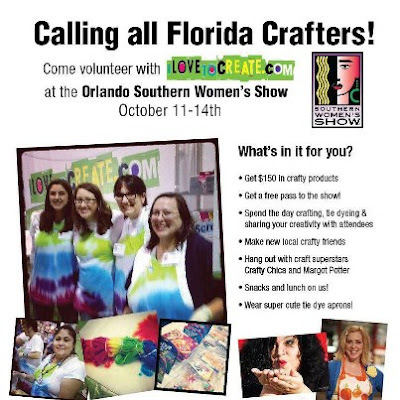 iLoveToCreate at the Southern Women's Shows! 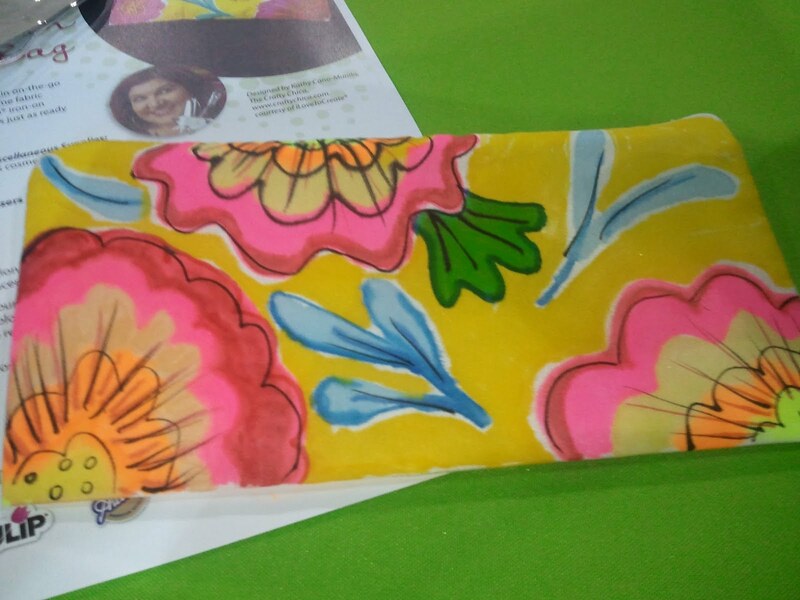 Last week I had the distinct pleasure of representing iLoveToCreate at the Southern Women's Show in Charlotte North Carolina. I was joined by the lovely and talented Crafty Chica, Kathy Cano-Murillo and Swell Designer-Alexa Westerfield (iLoveToCreate's social networking diva.) We had three big stage classes each day and all day tie dye booths set up at the back of our stage booth manned by a bevy of wonderful, talented volunteers. I taught three classes all designed by the amazing Ms. Pattie Donham a.k.a. PattieWack! Pattie is one of the most versatile women in the craft industry and is the Spokesperson and Lead Designer for iLoveToCreat. She can do everything from sewing to painting to surface design to building...well, you name it, this gal can do it and do it with style! She's a TV Host, spokeswoman, designer, product designer, writer, visionary...she's at least seventeen different kinds of awesome. 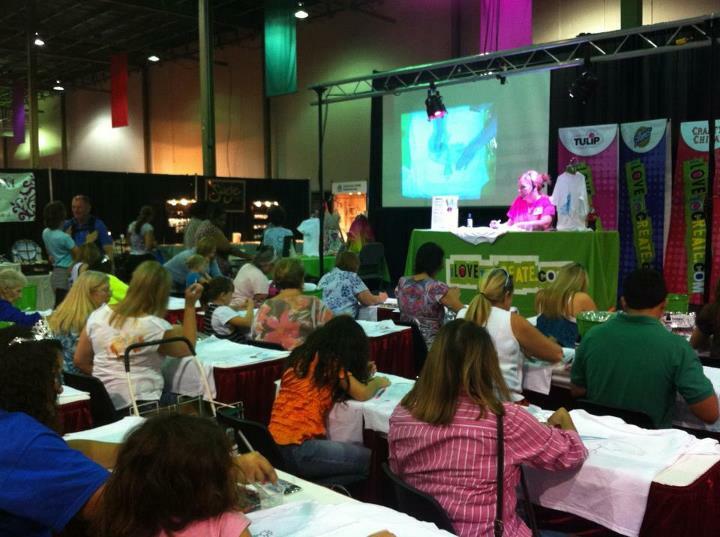 Her watercolor wonder t-shirt class was such a huge hit, people were fighting to get a seat! But guess what? You can make a shirt of your own by following this link to her tutorial online! 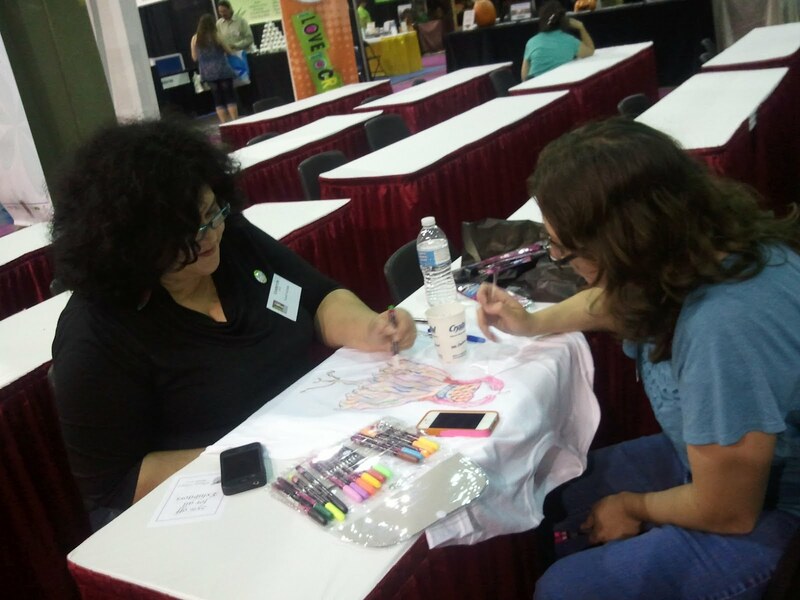 We had a non-stop stream of crafty and crafty curious folks during the four day event. Several things stood out for me. Firstly, I loved how everyone gave every project their own spin. Every project in every class was unique, and everyone had a great time. Secondly, though there were a few Grumpy Gerties, almost everyone left with a huge smile on their face. Even the Grumpy Gerties cheered up when Crafty Chica took out a bucket of glitter jars and handed them out like trick or treat! From young kids to old folks, they all got something out of the experience, not the least of which was the joy that comes from making something with your hands. We had them shouting from the rooftops, "I LOVE TO CREATE!" Oil Cloth Inspired Silk Pouch Class with Crafty Chica, I had so much fun making this! And that is some powerful stuff right there. Because ultimately, that's the point. We all loved to create as kids. We could sit for hours with a coloring book or a mud pie or a bin of building blocks blissfully unaware that there were rules about the end results. Because, there are no rules. The only rule when creating is having fun! But somewhere along the way, our inner critic switched on and our outer critics told us we weren't artists. It's so fun seeing people let that stuff go and just dive into making art. Watching so many people have so much fun made all of the hard work we put into setting up and breaking down and making a great experience worthwhile. They were long days and I was plum tuckered, but I was also pleased as pudding to share the spark of creativity with others. If you live in the Orlando Area, we need you! 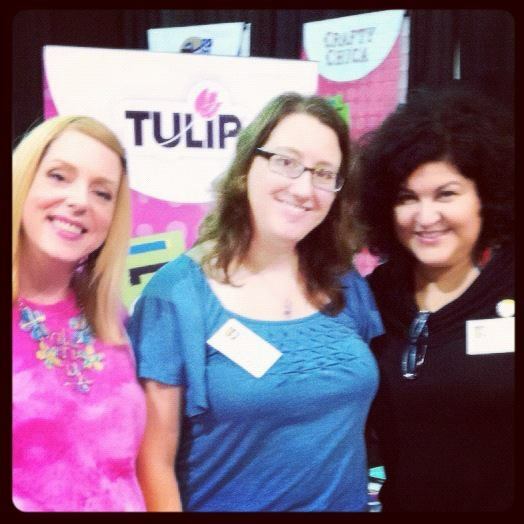 Kathy and I will be joined by her lovely daughter and iLTC Blogger Maya Murillo at The Southern Women's Show Orlando! 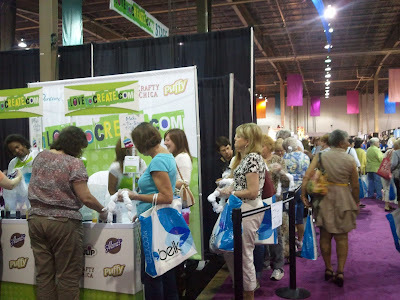 Volunteers will receive 150 dollars in free craft supplies and a free lunch for helping us at the show. Or come and take our classes, but come early because it's sure to be Standing Room Only again!